Hi everyone! 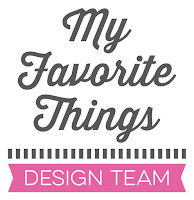 Today is the third day of the My Favorite Things August release countdown. This release is packed with amazing new products and it was so fun to play with all the new stuff! I colored the Mummy with Copic markers and pencils. The sentiment is form the Mummy set too. I made the background using some die-cuts from the Die-namics Flat Bottom Clouds and Clouds Trio: I sponged the clouds with Grape Jelly dye ink to create the sky. The grass is from the Die-namics Grassy Edges. This is really cute Francine. I just love your purple clouds! What a cutie-patootie. So fun to send to my granddaughter. Beautiful card! The purple clouds are awesome! Wonderfully amazing and totally delightful!! This is so well done - the sponging is perfection and the coloring is FIRST CLASS!!! You just always leave such a signature mark of excellence on all your cards!!! So impressed by you - what a treat to follow you!! Hope life is treating you well and that you are happy!! Great sentiment with a great background and the cute mummy. A very cute and clever card. Sweet card Francine. 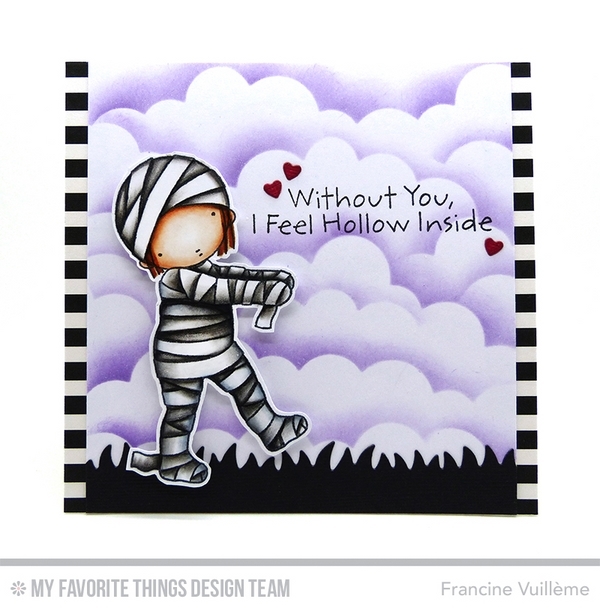 This little mummy and the sentiments are so darn cute. Great job on the card. Thanks for sharing. I Love the colors you used. This image is so cute. Thanks for sharing! Wow! I can't stop looking at the clouds, they are just SO beautiful. Thank you for sharing such a beautiful card. Love that Cloud background on this card. Great Scenic card! these purple sky is so pretty, is an adorable card!